Sopa de Pedra, or Stone soup, is a famous Portuguese dish originating in the region of Almerim, and unlike its name, it does not involve eating any stones. The famous tale about the soup has to do with the act of sharing in times of need. It is truly emblematic of Portuguese cuisine, as it uses all of the ingredients available in order to waste no food. Using all of the pig parts along with signature Portuguese pork sausages like chourico and morcella, it perfectly combines for a hearty rich soup that has wonderful scent and flavor. 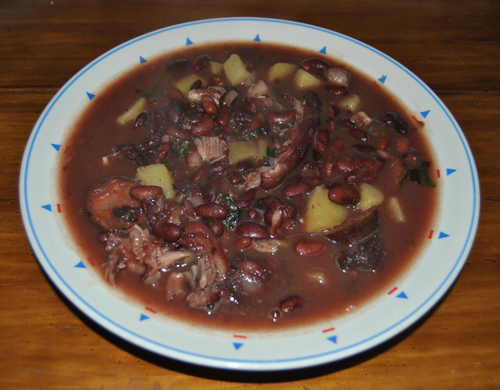 1) In a saucepan, boil the kidney beans with the pig’s ear, sausages, pork belly, onions, garlic and bay leaf in some water. Season with the olive oil and salt and pepper to taste. 2) Once the meat is cooked, take it out and reserve, then add the diced potatoes and cilantro to the pot. 3) Let the potatoes cook on medium to high heat for about 30-35 minutes. 4) Once the potatoes are well cooked, remove the pot from the heat and add the meat back in and stir it well. 5) Pour into bowls and serve.